By Robert RizzutoTwila Barnes, an amateur Cherokee genealogist in Missouri who has been an outspoken critic of Warren's Native American claims, said the new website aims to encourage the Harvard Law School professor to denounce her previous claims of Cherokee ancestry. 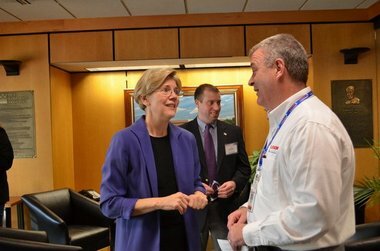 "We would like Elizabeth Warren to acknowledge that her family story isn't true," Barnes told MassLive.com. "I believe she does have a family story, as a lot of people do, but after an investigation and research, it turns out that the story isn't true. It is dangerous for someone in her position, who might become a U.S. Senator, to be falsely claiming to be Cherokee when she can't prove it. "And:"If you look white and grew up white, you probably didn't deal with the same issues true minorities do and you shouldn't be calling yourself a minority," Barnes said. "I wouldn't consider what she did malicious at the time, but I think she was definitely trying to take advantage of the system." Elizabeth Warren–The Cherokees Will Not be SilencedMany wonder why we Cherokees are so insistent on Elizabeth Warren coming clean about her false claims of Cherokee ancestry. This is not a political issue to us. We don’t care if Elizabeth Warren is a Democrat, Republican, or an Independent. We do care, though, if she goes around claiming to be Cherokee and has tried to benefit from that claim. Some people might not realize there are only three federally recognized Cherokee tribes in the United States, but there are more than 200 groups who fraudulently claim to be Cherokee tribes. While the federally recognized tribes have very specific criteria their members must meet in order to be enrolled or registered, there is no consistent criterion for membership into the fraudulent groups. Many members of these fraudulent groups base their claim of Cherokee ancestry on the same thing Ms. Warren bases hers on…family lore. Though some might argue Ms. Warren is only one individual and therefore her claim cannot possibly cause harm to the Cherokee people, we would remind you that each of the fraudulent Cherokee groups are made up of individuals. Alone, none of these people would be harmful, but together, they are. In 2010, one fraudulent Cherokee group planned a march on Washington DC in an attempt to have the federal recognition of the three legitimate Cherokee tribes removed because those three tribes would not allow fakes to enroll or register with them. Like Warren, these individuals believe that family lore is all that should be required to claim Cherokee ancestry. 1987, a fraudulent Cherokee group in Ohio stood over the graves of the repatriated remains of Indians, while pretending to be Indians themselves. Like Warren and her contributions to the Pow Wow Chow cookbook, those fake Indians bastardized our traditions by doing things that were not representative of true Cherokee culture. From 2002-2005, a fraudulent Cherokee group in Arkansas, along with several school districts, was involved in defrauding the US government out of monies intended for real Indian students. Like Warren in her “checking the box” to further her career, these people did the exact same thing, “checked the box”, in order to try to benefit from it. We have researched Ms. Warren’s ancestry in the line she claims to be Cherokee through, as well as researched the collateral lines connected to that family. There is absolutely no indication of her having anything other than Caucasian ancestors. Though Ms. Warren’s ancestors did move into the areas that later became Oklahoma, they arrived at the same time many other non-Indian families arrived–when the land was going to be opened up and they thought they could get free or cheap land from the Indians. Ms. Warren’s ancestors were not Cherokees and neither is she. We, as Cherokees, cannot allow Ms. Warren to continue on with her false claims. If we allow someone as high profile as her to get away with it, then everyone else will expect a free pass as well. The authentic Cherokee tribes are made up of descendants of those listed on either the Dawes or Baker Rolls. Those rolls include the names of citizens who stayed with their nations; helped clear and farm their nations' land; helped build their nations' businesses and schools; participated in their nations' governments; and defended their nations in times of war and unrest. Through their loyalty to their nations, those Cherokee citizens paid the price for their descendants to have the right to call themselves Cherokee today. No one else has that right; not the individual walking down the street, not the members of the fraudulent tribes and certainly not a person who is running for the United States Congress. It is time for Ms. Warren to come clean and tell the truth. Until she does, we will not be silenced.Comment: The website tells us why Elizabeth Warren's case is an important issue. She's claimed to be Native and been touted as such by her employers. If she can do that, so can Ward Churchill, Johnny Depp, Miley Cyrus, and the rest. A fraction of Native blood, or the belief that they have a fraction of Native blood, will be enough for everyone. A few million real Indians will be swamped by tens of millions of wannabes. For more on Elizabeth Warren, see Harvard Reported Warren as Native and Warren: "My Mother Told Me So."